The Lumiere Push-Fit Fabric backwall is perfect for Tradeshows and events, additionally this fabric backdrop also works great as a divider wall in retail environments. The combination of innovative silicone-edge graphics (SEG) and popup display frame offers an easy and cost effective display with no distortion around the edges. The Lumiere geometric frame collapses down to pack up in the convenient travel bag. Setup can be done by 1 person in about 5-10 minutes. Portable, easy and stylish. 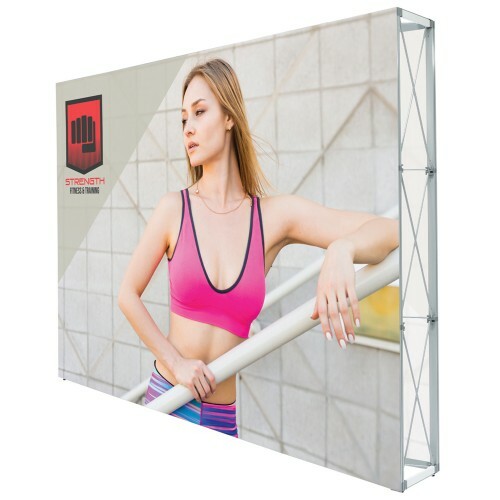 The Lumiere push-fit fabric backwall is a wise choice for exhibitors looking to save time and energy, yet still accomplish a higher level of professional look. The popup display is one of the fastest displays to setup and take down.